Okay you may have read my post regarding my infatuation with epilators and now what? I have friends asking me if using an epilator hurts and questions like how to use it. So here I'll be sharing some tips and my experience. 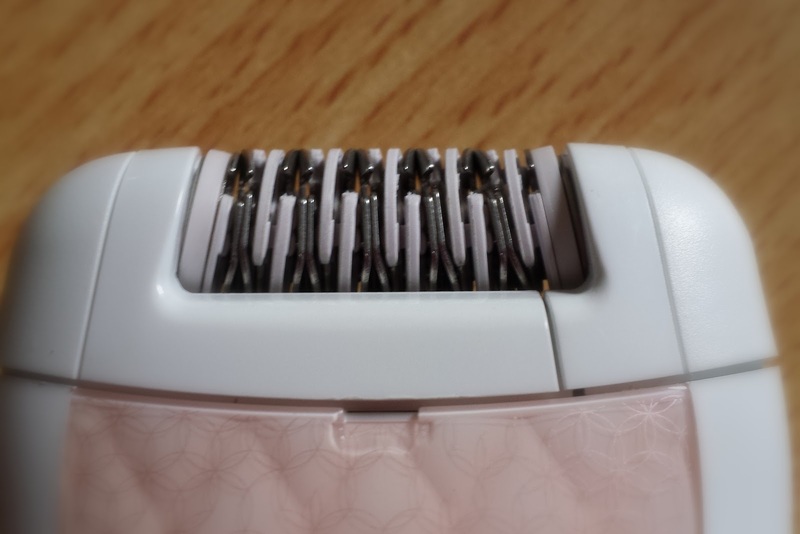 The epilator has something like small mechanical tweezers compacted together. As the epilator is move across the skin these small tweezers rotate pulling out those unwanted hairs from the root in clusters. I remember the first time I plugged it on, when I heard the loud buzzing sound coming from the epilator I became nervous. I really thought I cannot go on with it but I did anyway. Epilate according to your preference. I don't really have rules when doing so but when I have something coming up or I've noticed that the hairs have started to grow then I do it. They would usually grow two to three weeks after epilation. #Tip: Epilate the night before your big event because some epilation sessions will most likely cause your skin to swell or end up giving your skin some redness especially for newbie's. This will give room for you skin to heal or recover. #Tip: Epilating with long unwanted hairs can hurt a bit. It's best to epilate when the hairs are shorter or just enough for the epilator to get a grip of the unwanted hairs to pull it out. Note: I only have a dry epilator with me so I cannot speak for wet epilators. 1. Exfoliate before epilating. Exfoliation removes dead skin cells from the surface of the skin which have a tendency to block the exit of the hair shaft. By doing so, it lessens the likelihood of clogged pores and ingrown hairs (a hair that does not emerge from the follicle but remains embedded in the skin). Ingrown hairs are those reddish raised bumps that's itchy. Yikes! Exfoliation also leaves the skin soft and smooth, so doing epilation after exfoliation makes the process more effective. #Tip: Dermatologies recommend exfoliating the underarms no more than twice a week to avoid skin irritation and damage. So don't overdo it. 3. Run the epilator againts the direction of your hair growth. When doing this for my underarms, I would usually raise my arms, face the mirror and gently stretch out that area of the skin where I would epilate so that it would be easy for the epilator to get a grip of the unwated hairs and pull it all out. 4. Repeat the process in step 3 until all the unwated hairs are pulled out. 5. Clean the epilated area from the pulled out hairs as well as your epilator using the cleaning brush included in your epilator set. And you're now ready to rock the event. I'd be a hypocrite if I'd say no. Yes it does most especially if your hairs have already gone long (we'll if you'd allow that to happen) and also on the first runs of the epilator against the unwanted hairs of your skin. I'm saying this not to scare you but to give you an idea of what it was like. But eventually you will get use to it. If you can tolerate waxing then you can tolerate this too. The more you use it the more you'll get use to it. Imagine it like small multiple tweezers pulling those hairs all at once. The idea is just like that. How about the hair growth? It all depends on how active your hair follicles are at the moment. For me, I can say that the hair growth is far lesser compared to shaving. The time when I was still shaving I noticed that two to three hair shafts have been growing on one hair root. This is because when shaving we are only getting rid of the hair on the surface but not the root. But by using the epilator, just like waxing, it removes the hair from the root. I can personally attest that the hairs have been growing lesser and slower. I initially am afraid of using the epilator thinking that my skin would get stuck. We'll it will if you don't follow instructions. The first time, I forgot to put the head cap for the underarms and so it happened. It hurts so bad! But that incident didn't discourage me from using the epilator. I've been a convert since and I love using the epilator. It's so convenient and you can epilate anytime. I use this method and it's my favorite. Great tip babe.